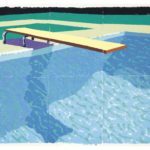 Capitalizing on the Hockney Sales Spike, Joe Lewis Dangles His Hockney: Observant art market professionals carefully scrutinized the large canvases by David Hockney gathered in a single room at the Met’s recent retrospective. Sharp eyes saw that the artist’s Pool with Two Figures from 1972, and a few of the other keystone works in the show, is still in private hands. The painting was once owned by David Geffen but the show clearly identified former Christie’s owner and financier Joe Lewis as the current owner.